Not everybody loves polenta the creamy corn-based dish from Italy. My late grandmother (who taught me so much about Italian cooking and even authored a cookbook) called it “peasant food”, a status that polenta has had for centuries, generally made by the poorer class as the ingredients were much cheaper than the expensive wheat and flours it took to make pasta. You can check out the History of Polenta and learn more about its origins. In this family we happen to love it. Polenta is really quite versatile as you can add so many flavors and elements to creamy polenta for a rich and satisfying dish. Now if you don’t have half a day to stand and stir the pot to make it correctly, there is now “instant polenta”, which snobs consider sub par and honestly it really can’t compare to the sublime creamy texture of homemade polenta in a bowl or in solid form, but practicality is the name of the game and I don’t have a day to commit to the creation of home-made polenta. If you do, all the power to you….and what time should I be over for dinner? I’ll bring the wine. The solid log of polenta you find in the grocery store, Whole Foods, Fresh Market even Publix has it so I assume you can find it most places is San Gennaro Italian Polenta. Gluten Free by design it is a staple you will almost always find in my kitchen as I use it in several different ways and recipes. Today we are talking about making kid sized GF pizza with it. Now you can adapt this recipe with ANY toppings you like, tomato sauce and cheese, pesto, veggies you name it. I have already done several different types, but the one I took pictures of is the one I am going to share. 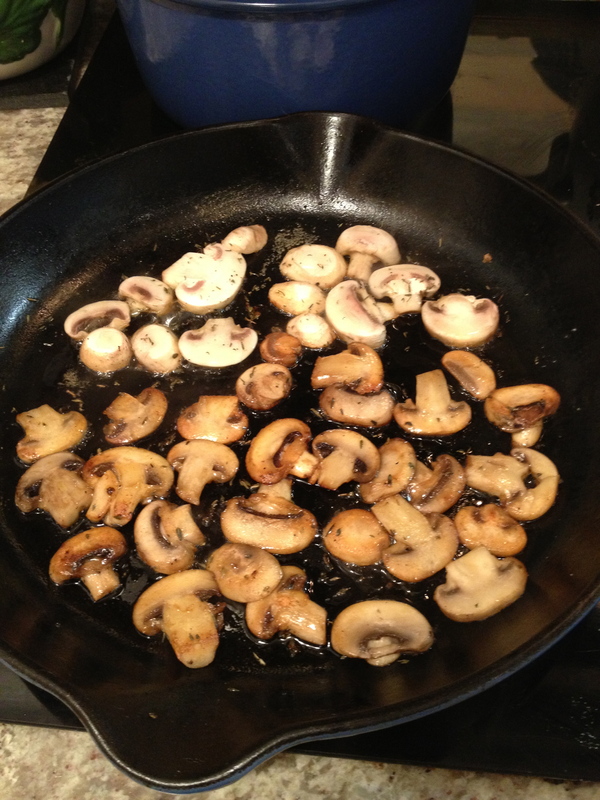 First sauté some sliced mushrooms in a little olive oil or butter – taste is your preference. Mushrooms may seem an odd choice for an 18 month old (when I first made this) but Littledude loves them and ANY chance to get a veggie in him theses days is the name of the game. Mushrooms soak up what you sauté them in and if you remember Julia Child…”Don’t crowd the mushrooms” if you want them to brown. Personally I like to add a touch of truffle salt to them sometimes but its all about your taste. I warned you I am a bit “loosey goosey” with exact measurements and ingredients at times, but cooking is an art, and full of options. Don’t be scared to experiment and make it your own. I won’t be offended, but if you do something different and it turns out well, then please share! Ok so while the mushrooms are browning, slice the polenta. Measurement wise….hmmmmm 1/4 inch thick perhaps? Oh yeah forgot to tell you to preheat the oven, sorry. Turn that bad boy on to 400°. Grease a tray with some olive oil or cooking spray, put the polenta slices on and pre-bake them for a bit to make them a bit crispy. About 5 – 7 minutes per side, touch test to make sure they aren’t mushy anymore. While that is happening slice the cherry tomatoes short ways not long ways so you have mini slices. Now it’s time to get out the Kale. You can use whatever you like but I am seriously partial to Organic Girl. Their line of mixed greens, spinach, kale etc are my absolute favorite. I worked with them on a cooking show called All Mixed Up at my last job and have been buying them ever since. When the mushrooms are finished – remove and set aside in a prep bowl and sauté the kale in the same pan, until wilted. By now the all the ingredients should be ready. Get your shredded mozzarella, or shred it yourself …..you over achiever you….. I also like to add some chopped fresh mozzarella as well. Take the polenta out of the oven and assemble however you like, although here is a tip. Put shredded Mozzarella down first so it melts and helps the other ingredients from sliding off. The first time I made these I just put the cheese on top and it all came sliding off. Load as much or as little as you want on them. Pop them in the oven for about another 5 minutes or until the cheese is all melty and yummy and…. Kid sized mini polenta pizzas that are in fact quite healthy. They were a hit with the Littledude, and at the time he was still eating all things green not picking it out of dishes. I have done these several ways since this and they are a standard and almost always sure hit. Ladybug is just now getting old enough and enough teeth to tackle these so will have to make them again soon. Try out your own variations and enjoy!